Dolly Parton’s Imagination Library is a book gifting program that mails free, high-quality books to children from birth until they begin school, no matter their family’s income. The Imagination Library program is built on decades of reading research consistently demonstrating that having books at home helps children develop literacy skills. Children from low-income homes across West Virginia deserve access to high-quality, developmentally appropriate books. The West Virginia Department of Education and Marshall University’s June Harless Center, in partnership with Dolly Parton’s Imagination Library, is fostering a love of books among West Virginia’s children. Books are delivered to the home on a monthly basis at no cost to families. 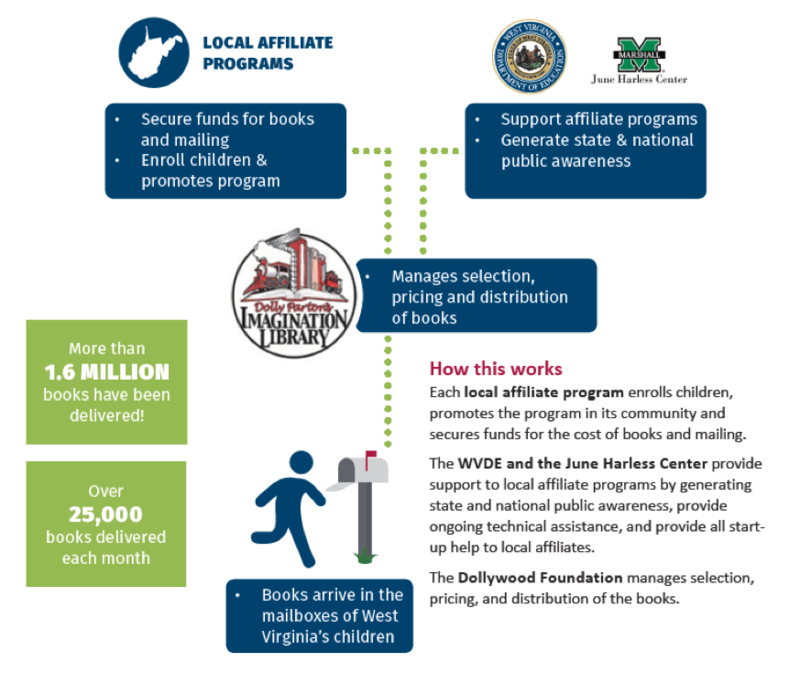 The long-term goal of this partnership is to ensure that every child in West-Virginia has access to age-appropriate books prior to entering a school.